The new Navy mayor reports to San Diego from Jacksonville, FL, where she served as commander of Navy Region Southeast. This will be her first San Diego assignment. Bolivar is a graduate of the U.S. Naval Academy, where she received a Bachelor of Science degree in oceanography. She also holds a Master of Science in Management degree from Troy State University. At sea, Bolivar began her career as a Navy diver and served in various leadership positions aboard the rescue and salvage ships USS Reclaimer, USS Grasp, USS Grapple and USS Recovery, culminating with the post of commanding officer of the USS Salvor. In Afghanistan, she led a team using electronic warfare techniques to detect and destroy improvised explosive devices. Her shore tours include service on the Secretary of the Navy’s White House liaison staff and the staff of Commander Naval Surface Forces Atlantic. 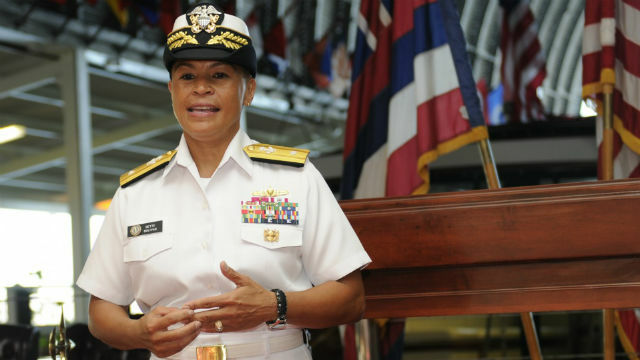 She was executive officer of Naval Amphibious Base Little Creek, military professor at the Asia-Pacific Center for Security Studies, commanding officer of Naval Weapons Station Yorktown, and commander of U.S. Naval Forces Marianas. Navy Region Southwest is a six-state region with more than 76,000 active-duty personnel at 10 installations.